Android 2.2 – The phone was definitely running Froyo as you can see from the screenshot above. As expected, the phone with its 1.0GHz processor was “noticeably more responsive” than his D1, but could have had something to do with 2.2 as well. 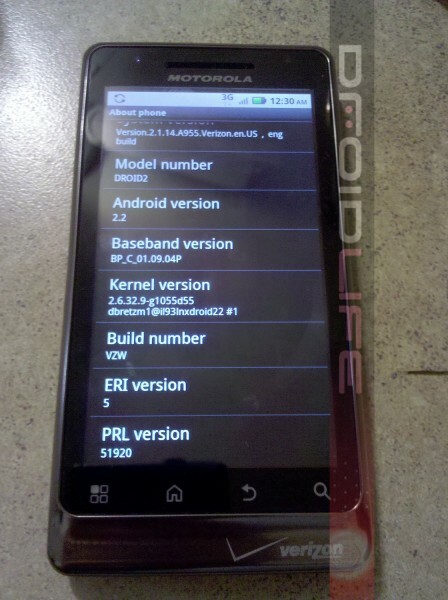 MotoBlur – The phone had the same Blur skin that we have on the Droid X. You can actually see that the notification bar is the same as the DX if you look closely. He mentioned only 5 screens though which matches the current Froyo launcher, but had the new arrow drawer button with the persistent phone and contact buttons a la Blur. He also pointed out the bundle of bloatware including the Blockbuster app, mobile hotspot and all of the Blur widgets. Keyboard – He had nothing but great remarks for the keyboard. In fact, these comments stuck out above the rest especially when the word “phenomenal” dropped. Sounds like Motorola fixed one issue at least. Feel/Look/Weight – Overall feel simply reminded him of the Droid 1. Same weight, same screen, just a new snazzier silver color and a “grill” on the back. Must have meant the speaker which is no longer gold. So does this answer a few of our questions? Maybe. The one thing we all really wanted to know was whether or not the phone would actually release with Android 2.2 on it. That answer should be pretty close to a definitive “yes” at this point. To see the D2 running Froyo that has already been masked with the new Blur means we’re close. This also means that Motorola and Verizon should be on schedule to deliver it to the DX and D1. It’s too bad they couldn’t have slapped an HDMI port in there and a front facing camera and we’d have arguably the new king of Android.